Cover Artwork: The Choir and the Belly Dancer by Machteld van Buren, Circus Europe (2012, collage, 140 x 100cm), reproduced by kind permission of the artist. The series of works entitled Circus Europe were created by Dutch artist Machteld van Buren in 2012 and are to be exhibited in Ireland and the Netherlands in 2013. Circus Europe consists of eight large collages which illustrate how the struggle for survival is being waged in various European countries. Most of the countries are depicted as an animal: the body consists of a map onto which the realistic head of an animal has been superimposed. Great Britain is portrayed with a number of horses’ heads, which form part of the landscape. The awkward juxtaposition of these figures suggests that the UK is not only struggling with its position within the EU, but is also divided by internal strife. Germany appears to be a bird of prey – not the traditional eagle, but a vulture.The juggling acts which these circus animals have to perform to keep themselves going are indicative of how each nation functions. Four Dutch poets and four Irish poets were invited to offer their interpretation of these images for publication in a book to go with the exhibition. The Irish poets are Jo Slade, Frank Golden, Jessie Lendennie and Patrick Chapman. The Dutch poets are Arnoud van Adrichem, Martin Reints, Lieke Marsman and Peter van Lier. 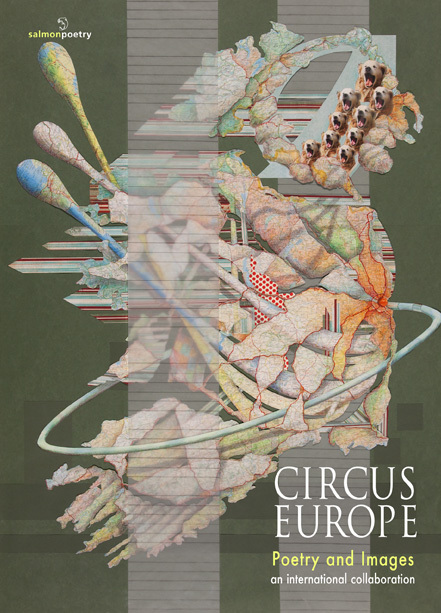 The book also contains full-colour reproductions of the eight collages from the Circus Europe exhibition. Machteld van Buren is an established artist and her work is in the collections of the Stedelijk Museum in Amsterdam, the Centraal Museum in Utrecht and the Fries Museum in Leeuwarden. Machteld van Buren (Breda, 1956) is a visual artist. She studied at the Gerrit Rietveld Academie and the Rijksakademie van Beeldende Kunsten in Amsterdam. Her work is in the collections of the Stedelijk Museum in Amsterdam, the Centraal Museum in Utrecht and the Fries Museum in Leeuwarden. In collaboration with the poet Peter van Lier she published two books of illustrated poems: Bodemsanering (Soil Cleanup, 2008) and Wisseling van de wacht (Changing of the Guard, 2011). Her work is exhibited regularly in The Netherlands in Kunstruimte Wagemans (Artspace Wagemans) in Beetsterzwaag. For further information see: www.machteldvanburen.nl. Arnoud van Adrichem (Delft, 1978) is a poet, editor-in-chief of the literary magazine Parmentier and member of the editorial board of the Flemish literary magazine DW B. He is also co-founder and editor of the platform for literary criticism Reactor, the literary weblog Ooteoote and publisher at Perdu. In 2008 he made his debut with Vis (Fish), a collection of poems which was nominated for the 2008 C. Buddingh Prize for new Dutch poetry, the prestigious 2009 Hugues C. Pernath Prize and the 2009 Charlotte Köhler Stipend. The bibliophilic collection Buiten (Outside) also appeared in 2008. In 2010 he published Stemvork (Tuning Fork), a collection of essays, poems and translations which he wrote in collaboration with Jan Lauwereyns. In the same year he published Een veelvoud ervan (A Multiple Thereof), a book that was nominated for the 2011 J.C. Bloem Poetry Prize. Patrick Chapman is the author of six poetry collections, the latest of which is A Promiscuity of Spines – New & Selected Poems, published by Salmon in 2012. His book of stories, The Wow Signal, appeared from Bluechrome in 2007. He has also written an award-winning short film, Burning the Bed (2003); a Doctor Who audio play, Fear of the Daleks (2007); as well as episodes of children’s television series Garth & Bev (2010) and the forthcoming Wildernuts (2013). In 2010 his work was nominated for a Pushcart Prize. Frank Golden has published a novel The Two Women Of Aganatz (Wolfhound Press), and four collections of poetry In Partial Settlement (Wiffle Press), On Route To Leameneh (Raven Arts Press), The Interior Act (Salmon), and In Daily Accord (Salmon). A new novel The Night Game focusing on participants in a dissociative identity therapy group has recently been completed. 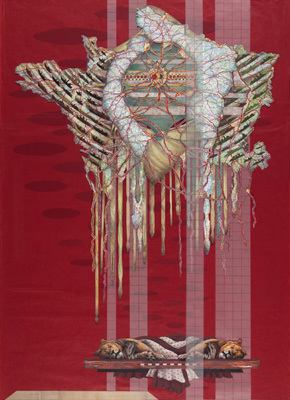 His last solo exhibition Living Through Air (Courthouse Gallery, 2009) was concerned with the aesthetics of brutality. September 2012 saw the premiere of his film A Room In Air which was shot within the confines of the Auxiliary Workhouse in Ballyvaughan. He has received bursaries and awards from the Arts Council of Ireland and the Irish Film Board. Jessie Lendennie was born in Arkansas, USA. After years of travel, she settled in Ireland in 1981. Her previous publications include a book-length prose poem Daughter (1988); reprinted as Daughter and Other Poems in 2001; and Walking Here (2011). She compiled and edited: Salmon: A Journey in Poetry, 1981-2007 (2007); Poetry: Reading it, Writing It, Publishing It (2009) and Dogs Singing: A Tribute Anthology (2010). She is co-founder (1981) and Managing Director of Salmon Poetry. Her poems, essays and articles have been widely published and she has given numerous readings, lectures and writing courses in Ireland and abroad, including Yale University; Rutgers University; The Irish Embassy, Washington D.C; The University of Alaska, Fairbanks and Anchorage; MIT, Boston; The Loft, Minneapolis, MN; Café Teatre, Copenhagen, Denmark; the University of Arkansas, Fayetteville; The Irish American Cultural Centre, Chicago and The Bowery Poetry Club, New York City. She is currently working on a memoir To Dance Beneath the Diamond Sky. Peter van Lier (Eindhoven, 1960) made his debut with Miniem gebaar (Slight Gesture) in 1995, which was awarded the Vlaamse Gids Prize. This was followed in 1998 by Gegroet o... (Hail, Oh...), which was awarded the Jan Campert Prize and was nominated for de VSB Poetry Prize. His most recent collections of poetry are Zes wenken voor muggen aan de deur (Six Tips for Mosquitoes at the Door, 2007) and Hoor (Listen, 2010). In collaboration with Machteld van Buren, he published Bodemsanering (Soil Cleanup, 2008) and Wisseling van de wacht (Changing of the Guard, 2011), two chapbooks in which words and images form a unified whole. For further information and translations of his work see: www.poetryinternationalweb.net. Lieke Marsman (Zaltbommel, 1990) is studying philosophy in Amsterdam. Her first volume of poetry Wat ik mezelf graag voorhoud (What I Like to Impress upon Myself) was published in the autumn of 2010 and won several prizes for the best debut. She is currently working on her second volume. Martin Reints (Amsterdam, 1950) has published five collections of poetry. After Waar ze komt daar is ze (Where She Comes, There She Is, 1981) he waited eleven years to publish his second book: Lichaam en ziel (Body and Soul, 1992), which was awarded the Herman Gorter Prize). The next two, Tussen de gebeurtenissen (Between Events, 2000) and Ballade van de winstwaarschuwing (Ballad of the Profit Warning, 2005) were both shortlisted for the prestigious VSB Poetry Prize. His most recent work is Lopende zaken (Matters at Hand, 2010). His collection of essays Nacht- en dagwerk (Night and Day Work, 1988) was awarded the Jan Greshoff Prize. For further information and translations of his work see: www.letterenfonds.nl/images/dossier/Reints-Dossier-screen.pdf and www.linkedin.com/pub/martin-reints/19/bb7/431. Jo Slade is a poet and painter. She is the author of four collections of poetry: In Fields I Hear Them Sing (Salmon, 1989); The Vigilant One (Salmon, 1994), which was nominated for the Irish Times/Aer Lingus Literature Prize. Certain Octobers (Editions Eireanna, Quimper France, 1997), a dual language English/French edition, which received a publication bursary from the Centre du Livre, Paris France; City of Bridges (Salmon, 2005) and a chapbook of poems, The Artist’s Room (Pighog Press, Brighton, England 2010). A collection of poetry, The Painter’s House, will be published by Salmon Poetry in 2013. Susan Massotty (Susanville, California, 1948) has been working as a literary translator from Dutch to English since 1985. She has translated numerous works of fiction and non-fiction, including Anne Frank’s Diary of a Young Girl, as well as books by G.L. Durlacher, Abdelkader Benali, Cees Nooteboom, Margriet de Moor and Kader Abdolah. In addition, she has translated poems by the Frisian poets Tsjêbbe Hettinga, Albertina Soepboer and Elmar Kuiper. In 2007 she was awarded the Vondel Translation Prize for her translation of Kader Abdolah’s My Father’s Notebook. She is currently hoping to retire, but work has a way of tracking her down.